I just finished a table runner after doing a workshop with the Elmira Needle Sisters. Or at least the top is done! My goal is to get the quilting done by Dec 11, 2015. 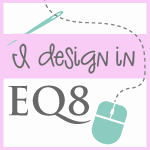 So hopefully, I can share the custom quilting design with you then! I do not have time to do a quilt right now with long arm obligations, pattern designs, teaching and this blog, my time is limited but I enjoyed making this table runner. Below is a pic of the table runner top. If you look closely, you will notice that I placed medical tape on the back side of the ruler to stop it from sliding while I was cutting. This is a great tip if you have this ruler. What I found out as I was taking the class is that Sew Kind of Wonderful has 25 patterns available, some are available here and 2 books that utilize this clearly versatile ruler! ​The ruler also squares your blocks and can be moved around to make other shapes (this is called techniques). These techniques are why they created patterns and books. They created a single product (the ruler) that can be expanded upon. It's on sale at Connecting Threads right now for 50% off you pay only $16.00 USD or approx 21.35 CDN . This is a real deal compared to what I paid for the ruler!! Also if you order over $75.00 there is free shipping. 12 Quilts in this book! The book above includes 6 techniques with the same ruler and 12 more quilts. Do I need to say more, there are rulers I buy and do not get much use out of them, but this ruler is going to get lots of use because, I love the quilts and plan to make more, they are fresh, modern, have lots of opportunity for quilting and the most recent book, has quilting suggestions in the back, yeah! If you purchase the book from them, please tell them I gave them a positive review! Oh and did I mention, I see scalloped edges on my quilts and borders with this ruler?? I dream of many projects from this wonderful group of ladies and their ruler, patterns and books in the new year. My dreams are colourful!